No One Fights Alone. 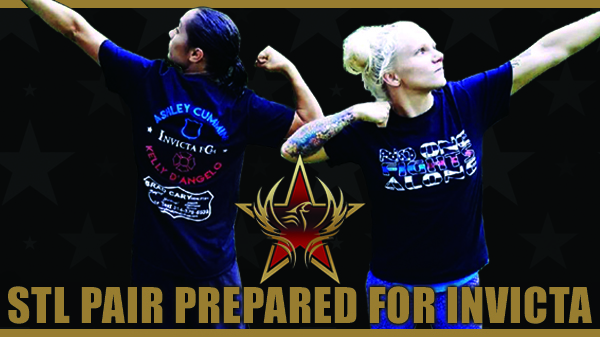 It's been the rallying cry for the Invicta FC 24 training camp of Kelly D'Angelo and Ashley Cummins as they prepare for fights this weekend in Kansas City. For Cummins, it's a number one contender's fight. A win would set up an atomweight title shot down the road. As for D'Angelo, it's a promotional debut, a chance to make a good first impression. Besides sharing the card at Invicta, the two are also fellow First Responders with D'Angelo a member of the fire department in St. Louis County Fire Department while Cummins works for the St Louis County Police Department. The two have a strong, unspoken bond as one-time training partners and members of the service community who's lives are hectic in and out of the gym. "MMA went really fast for me," D'Angelo said. "I boxed for five years and this is only like the third or fourth year for MMA. A lot of these girls have been doing it for six-plus years. I do feel like it has all happened kind of fast, but I'm 30 so I'm ok with it going a little quicker. When I got into this it was a full commitment, so the faster I can get to the top the better." D'Angelo started her mixed martial arts training in 2014 at Steve Berger's Fit or Fight. As a coach Berger, a UFV-vet and pioneer for MMA in St. Louis, groomed a raw Barb Honchak into a world class fighter who would win numerous regional titles before heating up the flyweight division for Invicta. In only her third fight with Invicta, Honchak would win the Invicta FC flyweight title, defending it twice, albeit her last three fights while training in Iowa. When D'Angelo started training with Berger, the comparisons to Honchak were bound to come. Despite Honchak returning to St. Louis often after winning her Invicta title, D'Angelo and Honchak never shared the mats together. Ironically enough, the first meeting between the two happened at the most recent Ultimate Fighter tryouts in April in Las Vegas. "Berger used to call me 'Little Barb,'" D'Angelo said. "Funny thing is, at the Ultimate Fighter tryouts I just went to, that was the first time I've ever met Barb. We actually sat at the same table together. So I go 'Hey Barb, I don't know if you know me,' and it's complete silence in the room, with cameras everywhere and she goes 'are you my mini me?!' So to be compared to her I'm absolutely ok with it. She's a great fighter and a great person. After meeting her and hanging out with her I'm ok with being 'Little Barb'." With D'Angelo weighing in at 126 pounds at the day of the tryouts, she was considered too small by the show's producers despite making it through the first two rounds of the tryout. When one door closes, another opens, and the opportunity with Invicta presented itself. After only two pro fights, D'Angelo signed a four-fight, two-year contract with Invicta FC, the all-women fight league operating primarily out of nearby Kansas City. Streaming all of their events to UFC Fight Pass, Invicta has become the marquee destination for female fighters who's division is not currently featured in the UFC. "I knew when I signed the Invicta contract that this was the stage for the best women in the world," D'Angelo said. "I knew when I signed what I would be going up against, and I've been putting in the time to be ready for it." Angelo, a local firefighter, and boxer. The hunt for a new home didn't take too long. 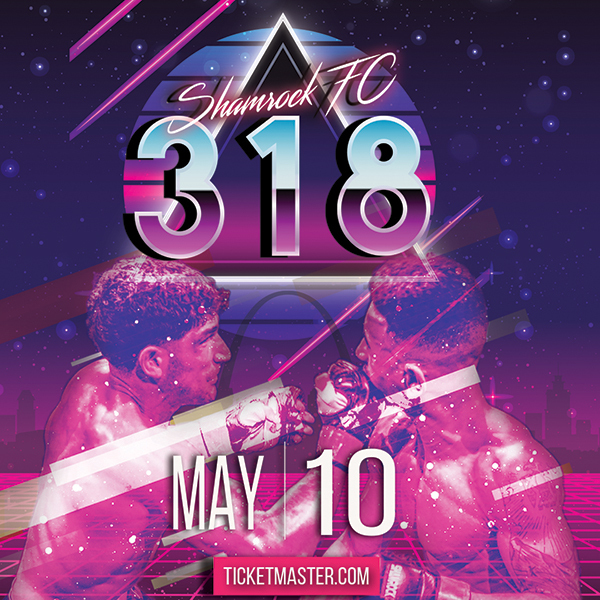 With a whole host of invitations from other fight teams on the table, it was Mike Rogers, head coach of St. Charles MMA, who's gym caught the eye of the D'Angelo's. "Of course when Berger's closed it was a big surprise," D'Angelo said. "We actually found out a week after my pro debut. We found out that the gym was closing, and it sucked because I had just become a pro and I wanted to keep the momentum going. I had talked to Mike a couple times at fights, and it's hard enough to find female training partners he said 'we have Britney (Cloudy) here and think you'd be really great working together and you need to come try it out'. I had tried a couple of other gyms, but after a week or two here I just knew this is where I would get the best knowledge, the best help, and best partners." In January, D'Angelo would win her second pro fight in at HFC 32 Indiana. A TKO in the third round improved her record to 2-0. Two finishes in two fights seemingly caught the attention of Invicta's President Shannon Knapp who signed D'Angelo to a contract then matched her up against a difficult first opponent in Sunna Rannveig Davidsdottir also 2-0 as a pro, both for Invicta and both by decision. "I've seen some of her Invicta fights, I think she's pretty well rounded," D'Angelo said. "I think she's a purple belt, and her dad was big into Muay Thai, and both of her pro wins were by decision, but that's about all I know of her. I like the fact that she's well-rounded. I've gained a lot of skills while here at St. Charles that I think I can display with a well-rounded opponent. I'm looking forward to being able to show off everything instead of just being a boxer." With her third pro fight on the horizon, a chance to compete alongside Cummins makes this bout extra special. "One of the first MMA fights I went to was Invicta, I think it was Ashley's first or second fight with them," D'Angelo said. "She was my main training partner when I started MMA, of course. Seeing that big stage and all the girls competing, I knew I wanted to be there one day. The fact that it's actually happening is beyond amazing, and to share the card and fight next to someone I've looked up to for so many years is really awesome." "It's always been hard for us to get rounds in with her schedule and my schedule," D'Angelo continued. "We have the two careers that have the most messed up schedules possible. With the fact we both have gyms that are really willing to work with our schedules, it's just been easier to train here." D'Angelo works a 48-96 work schedule meaning she works two days straight with four days off. In addition to her work at the fire department, she also works part time at the fire academy as a PT and assistant instructor. "There is no regular schedule," D'Angelo said. "My 48-96 actually rotates. One week I work Friday/Saturday, the next week I work Thursday/Friday. It rotates backwards every week so it's not like I'll be there every Wednesday or something. It's never consistent." In her ten years training and fighting in the sport, Cummins has competed at strawweight. A bit of a rough patch and a switch in training camps saw the 29-year-old rejuvenated and back on a two-fight win streak at her new weight-class of atomweight (105 pounds). "This is honestly the best I've ever felt, best weight cut I've ever had," Cummins said. "As I'm getting older the weight cut is getting easier. I can't explain it but the weight just flies off." Cummins is quick to credit her team at the Wentzville-based Wolves' Den Training Center for her recent successes. "I've been at the Wolves' Den since its beginning," Cummins said. "This is by far the best gym I've ever been at. Now that I've been here for over two years, I feel very established in all aspects of MMA. My stand-up is better than ever, my wrestling, my jiu-jitsu. I've also been training at Gracie Humaita for over three years and my jiu-jitsu has skyrocketed from training with all of those top-level female jiu-jitsu competitors. I'm confident going into this fight. I'm one of the best in the world at 105. I honestly don't think anyone can beat me at this weight class." A total team effort has fueled Cummins to two-straight wins (Bellator and Invicta) after dropping three in a row. "This is the first time I've ever had teammates and coaching staff sit down and study my opponents for hours," Cummins said. "I used to watch video tape on my opponents, and since I've been at this gym I don't anymore. I haven't watched a single second of my opponent's fights. My last fight against Amber Brown, she's ranked No. 5 in the world. I didn't watch a second of her fights. The coaches here spent hours studying my opponent's strengths and weaknesses, taking notes, and tell me everything I need to know. My teammates study my opponents so when it's time to spar they mimic everything my opponent does. The training camps here are the best you're going to find." In the early days, there wasn't an Invicta FC and the UFC was for men only, Ronda Rousey had yet to break mixed martial art's glass ceiling. Fights for women were hard to come by. "I started in 2007 and it was tough to get fights," Cummins said. "There was only one promotion that had female fights and it was called Hook-n-Shoot. But other than that, there really wasn't any place in the world where you could get fights consistently." Most of Cummins four-years as an amateur were spent with Las Vegas based promotions Hook-n-Shoot and Tuff-N-uff which meant lots of travel to get fights. D'Angelo's career trajectory is eerily similar to Cummins' own. After a perfect amateur run, Cummins would her first two as a pro, before being signed to Invicta for their inaugural event. A win over Sofia Bagherdai made for a perfect Invicta debut, the fight with Jihn Yu Frey will be her 6th fight for the promotion. Ironically it was shortly before Cummins' Invicta fight when the friendship was forged with D'Angelo. The two met at a local charity event that features firefighters and police competing in amateur boxing. The annual event at Scottrade Center raises money for Backstoppers, The 2016 edition raised $635,000 for the charity. "Kelly and I have been friends for six-seven years now," Cummins said. "We met through Guns n' Hoses boxing, an event they put on every year for first responders. Every since then, we've always been good friends, and we were even teammates at Berger's MMA. Kelly and I have always been there for each other. When Officer (Blake) Snyder was killed Kelly reached out and was there for me." The dream of someday fighting alongside each other for Invicta was hatched many years ago on the mats at Berger's MMA. "I've been even more amped for this fight because Kelly is there with me," Cummins said. "We're both there representing St. Louis MMA and both representing our professions as first responders. This is what we've both been waiting for. We've been talking for years about both of us fighting on Invicta together, and it's finally happening." The kinship between training partners and teammates is strong, but mix in the partnership of two members of a dangerous occupation that services the community, it makes for a very powerful bond. "You're not going to find an understanding between two fighters like us," Cummins said. "Not only are we pro fighters, but we're also first responders. We have two of the most dangerous jobs that you can have. The constant stress we're under at work plus our professional fight careers. The majority of the other pro fighters, don't have jobs let alone a dangerous job." If all goes to plan, Cummins will follow in the footsteps of a long-time friend, Honchak, and bring an Invicta title back to St. Louis. Honchak blazed the trail for female fighters in the Midwest. The two were once training partners and have remained close for many years. The pair met in 2088 when Cummins, at the time training at St. Charles MMA, and Honchak started cross-training together. Honchak introduced Cummins to her pal Cat Zingano and the two were very important to Cummins formative years as a female athlete. "At the time we were the only two females not only in St. Louis but a huge radius of the Midwest as well," Cummins said. "Barb and I always leaned on each other and cross-trained together when we had fights coming up. I looked up to her and I still do. She's a pioneer in the sport and has done so much for female athletes, and I have a lot of respect for her. It sucked when she moved. I was devastated. I was like, 'man that's my main training partner'. We still keep in contact and I hope to see her in the UFC soon now that they're opening up the 125 division." Cool and confident, Cummins is ready for her next challenge. Standing in her way is the No. 2 ranked atommweight Jihn Yu Frey. Frey is coming into the bout off a loss in September. A scheduled bout in March was canceled when Frey's opponent didn't make the contractual weight. "I've been in this sport for 10 years and this is what I've always wanted," Cummins said. "I'm a very goal orientated person. I always set goals in front of me. When I first started training my goal was to fight amateur. Then it was to turn pro. Once I turned pro I wanted to be a world champion. I know I have a tough opponent but I'm confident I'm better than her. I honestly don't think anyone at this weight class can beat me." In addition to every fight Cummins takes, she also takes on a cause. This fight is no different as she will be fighting in support of Officer Mike Shepard. "When I fought for Bellator I sold Smashley t-shirts," Cummins said. "All the money went to St. Louis Pet Rescue. The last fight I dedicated it to Officer (Blake) Snyder. When he was killed it was very devastating to my whole police department and I wanted to do something to give back to his family and let the world know he was a hero." Shepard, a co-worker of Cummins when she first started at the West County precinct, was recently diagnosed with brain cancer. "I had an idea with this fight to do another t-shirt fundraiser," Cummins said. "Kelly contacted me and was like 'let's do a t-shirt and give it to charity' I was like funny you should say that. Let's do a join t-shirt and we can raise even more money for this officer. She was excited about it, so that's what we're doing now. It's crazy because we're both training full time, we both have full-time jobs, and now we're trying to balance these t-shirt sales, but at the end of the day it's worth it." The response has already been way bigger than the two have expected. "We had to order more shirts because we've sold out," Cummins said. "We've already raised over $3000 and it's going to keep going. After the fights are over we're going to collect all the money and present it to Officer Shepard." To donate directly to the Officer Shepard fund, click this link. Be sure to watch Cummins and D'Angelo compete this Saturday night for Invicta FC on UFC Fight Pass.